Much is owed to the 1982 film "Blade Runner", for although its dystopian future of 2019 is unlikely to come to pass, at least in the year it was set, some elements of Ridley Scott's film do seem to be just around the corner. A society in which human connections seem to be breaking down, technology equally helpful and a hindrance, and all wrapped in a cocoon of omnipresent advertising. From the perspective of 2011 all we're missing is a few years for the evolution of present technology and androids which look like Joanna Cassidy and Daryl Hannah. First time novelist Jeffery M. Anderson has set his engaging novel Ephemera into a near future America where advertising is so all-pervading that it's impossible to cast a gaze without being assaulted by notices for the latest and greatest, a government which is the end result of over a century of aggressive growth and technology which permeates every facet of life – from artificial pets to web-enabled goggles that remove the need to actually talk to someone. It's the kind of future that some actually dream about but would drive most insane by the sheer torrent of noise. It's into this world that Anderson thrusts his protagonist Nester Cab into. Cab is the prototypical hack writer whose particular gig involves working for a magazine that critiques movie critics. One day Cab receives a fax with the picture of a soldier stationed in the Middle East and a note urging him to investigate further. Cab learns that the young soldier, who has been sending regular video greetings back to his family in the United States, is actually dead and not the only one who is somehow managing to communicate from beyond the grave. What began as a promising story – which serves as an introduction to the actual plot – quickly overturns Cab's life. In short order he's kidnapped by a representative of an underground movement aimed at pushing back against dehumanizing technology and a government which is all but a tyranny. Introduced to the group's oddball leader, Smedley Butler, Cab is led into a rabbit hole from which there is no escape. He learns secrets about the government which would shake American society to its core – assuming anyone paid any attention – and the group's suicidal plan to reveal the truth to the world. Cab finds himself paired with his kidnapper Tex, a man with a southern drawl so impressive that it won't come as a surprise it's fake, and the two quickly find themselves hunted by government agents as they investigate a ruthless senior government official behind it all. The scope of the conspiracy shocks the pair as they discover the truth behind a recent news story and what it portends for the entire world. Throughout Cab isn't entirely sure he's allied with the good guys or if they're simply less misguided than his foes. Given that Ephemera is a self-published novel it's probably no surprise that there are a few issues with it. There are the very occasional problems with grammar and Anderson sometimes crafted overly florid sentences in an effort which should read quickly. There is also the question of a character that is important to Nester who abruptly disappears near the end of the novel – which is appropriate to Nester but leaves the reader wondering about their fate. These criticisms, however, should be placed in context; Anderson has crafted a winning novel outside of the mainstream publishing industry and presumably with limited professional assistance. 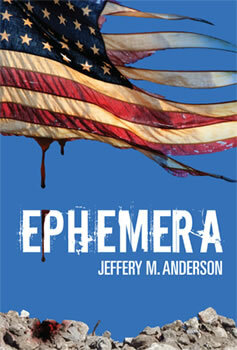 Compared to the average self-published effort, Ephemera is solid novel that won't disappoint the reader. In the end Ephemera is part-thriller, part-futuristic story which invites the reader to ask questions about all sides of the debate about our collective future. Although it ends with a somewhat mournful note, Anderson's novel can serve as a warning against technology which purports to connect us while actually isolating us, governments which take advantage of our apathy and the general and cynical malaise which allows societies to transform into vehicles which serve the interests of a few. Ephemera is at times a sombre novel that clearly expresses Anderson's discontent at the world we live in but it's also his call to wake-up and take charge. Good thing those goggles don't exist…yet.